Thank you for helping to make our Saturday runs so successful! Water stops are an essential part of our weekly get-togethers and your support is much appreciated. Please follow the guidelines below to ensure there are enough supplies at each station. 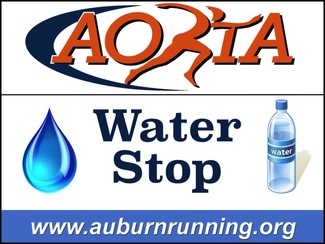 Water stop signs and coolers are available at: 1536 Professional Parkway, Auburn, AL. Coolers and signs can be picked up Mon-Thur from 8AM-4PM and on Fridays from 8AM-12 noon. Items are in the room next to the back door. If you are unable to pick up supplies on these dates/times, please e-mail me at [email protected] to make alternative arrangements. Woodfield Dr. / S. Donahue Dr.
W. Railroad Ave / N. Donahue Dr.
Heard Ave / Dumas Dr.